In the current era people use different smart phones for their personal use and their business profit motives. In each stage of their life they need a smart phone for which an attractive mobile app development is for sure necessary and our mobile app developers assure providing their best, to have an interactive, interesting and useful experience in every mobile application they build. Today it’s not limited to only professionals to be using smart phones. Kids even of 4yrs age know how to download and play games on these devices. So, what would be interesting to do is, make learning an enjoyable and interesting activity rather than boring and dumb and collaborating gaming with education on phones. 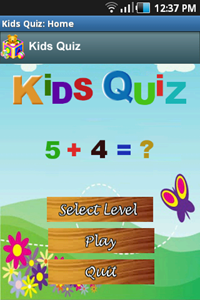 This is one of another android application been developed by Kenovate Solutions. Other applications been developed has helped business to streamline their processes, managing and handling data. Few other applications have even helped companies to synchronize offline & online data to keep everything in sync. For any of your android application development requirement for similar or business operations – to bring desk on palm – get in touch with us for best quality and successful early launch to the market. Kenovate is a prominent mobile apps development company that provides specialized process automation solutions, application development (on web or phone) and web promotion services with interactive, best user interface and bringing awesome experience on smart phones at the best rates!